WIN94 GENERAL BLURBCHARLES SPURGEON CHRISTIAN LIVING CLASSICS Compiled by Robert HallLong before the concept of the Megachurch emerged, nearly6,000 people crowded every service at the MetropolitanTabernacle to hear Charles Spurgeon. Now you can discover whyhis masterful preaching, so solidly biblical, understandable,passionate and wonderfully visual, astonished his era!SPECIFIC BLURB: Spurgeon was a great believer and teacher inpassionate,HolySpirit-directedprayer.HisdescriptionsofthemajesticthroneofgracethatGodcallsustocomebeforeis well worth the price of this inspiring and challengingbookalone!192pages,fromEmeraldBooks. About "The Power of Prayer in a Believer's Life (Christian Living Classics: Believer's Life Series)"
"Of The Power of Prayer in a Believer's Life, "Billy Graham has said, "This is one of the finest, most helpful books on prayer you will ever find." The Believer's Life series contains the best of Charles Spurgeon's (1834-1892) practical teaching on these subjects vital to Christian livng. When people would walk through the Metropolitan Tabernacle, Spurgeon would take them to the basement prayer room where people were always on their knees interceding for the church. Then Spurgeon would declare, "Here is the powerhouse of this church." That statement is backed by the amazing number of sermons that spurgeon preached on prayer. 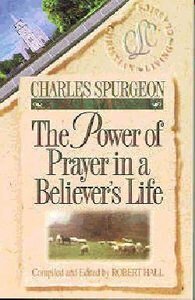 Spurgeon was a great believer and teacher in passionate, Holy Spirit-directed prayer. His word pictures of the majestic throne of grace that God calls believers to be privileged to come before is well worth the price of the book alone. You will be inspired and challenged in your prayer life, especially if you experience struggles in prayer.